The G2460PQU from AOC is a game orientated monitor capable of running at 144hz, that means it is capable of displaying 144 frames on screen every second to give you beautifully smooth animation assuming your graphics card is capable of outputting at that rate.. When it was first released it was actually one of the few screens to offer this but now there are plenty of others to choose from. 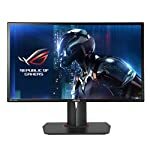 Whilst being a gamer friendly monitor, there is no adaptive sync present, so you might want to consider other options that include FreeSync or G-Sync if you have a compatible card. Otherwise this is a 24″, 1080p monitor with a TN panel built to be fast, responsive and lag free. AOC also have the following similar models that include G-Sync (G2460PG), and FreeSync (G2460PF). I would recommend checking these out. 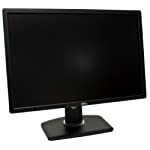 The monitor sports a brushed finish, giving it a slightly more premium feel compared to glossy black plastic. A red stripe across the bottom reminds us that this is a monitor for playing games on. I suppose it looks the part but it detracts from a more formal home office setup. You can hook it up to your gaming rig via the DVI, HDMI, and DisplayPort 1.2 connectors, there’s also an old style VGA port for those that still have graphics card that support the standard. Professional reviews give very good feedback on the monitors speed and responsiveness. This model was built to give a lag free gaming experience. The TN panel has some limitations but still performs well. Assuming your graphics card has the power, running games at 144hz will be an excellent experience for the serious gamers. If you’ve never gone beyond 60hz before you’ll notice the improvement. No adaptive sync technology is included here, you might want to look at newer alternatives that include this tech. We give the AOC G2460PQU a 4 out of 5 rating. Want to know what existing owners of the monitor think? You can read real user reviews here. 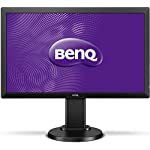 Should I buy the AOC G2460PQU? 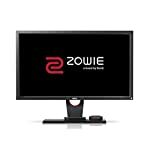 This is a fast and responsive gaming monitor that won't disappoint serious gamers. However with newer models offering adaptive sync and with a trend for higher resolutions and larger screens I would recommend looking at some alternatives. If you are having some doubts about this purchase then why not read some real owner reviews and see what other buyers think. 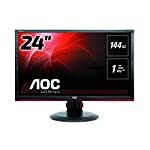 Welcome to the AOC G2460PQU FAQ. This section attempts to answer common questions you may have, please get in touch if you have any more queries or if you think our answers need updating. Can I hook up my PS4 or XBOne? Sure, but it would be overkill for those consoles as they only run up to 60hz.